At first glance, it may seem like a Carmen Miranda-inspired fruit and an overweight, redheaded Viking probably wouldn’t have much to talk about at a party. 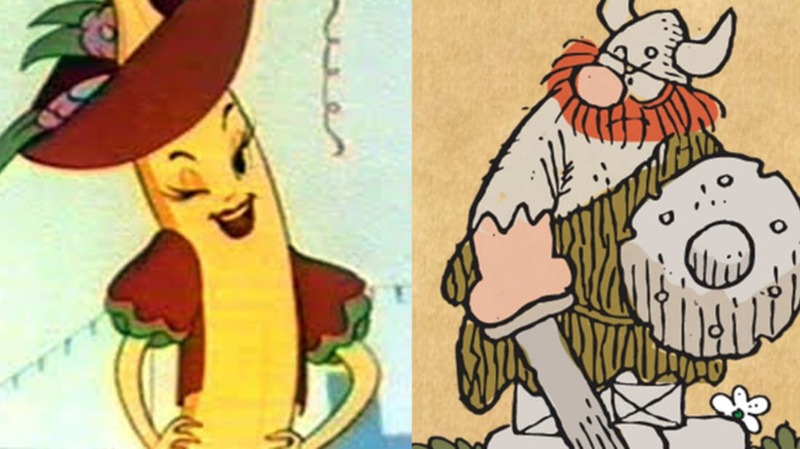 But the mismatched pair have one very important thing in common: Their creator, Dik Browne. Before Browne was a regular on the comics page with strips like Hägar the Horrible and Hi and Lois, he paid the bills by working at advertising firm Johnstone & Cushing. There, he was one of the company’s most prolific artists, known for being able to draw without looking down. Browne’s skill became even more evident when he illustrated not one, not two, but three iconic advertising characters and logos that remain in use even today. Not only did he create the “First Lady of Fruit” for the Chiquita company in 1944, he also came up with the Birds Eye bird and a more modern redesign of the Campbell’s Soup kids. It was one of Browne’s ads for Mounds candy bars that caught the attention of Mort Walker, the man behind the popular Beetle Bailey strip. Walker was working on a spin-off for Beetle Bailey’s sister, Lois, and felt that Browne’s style was just the ticket. He was right, and Hi and Lois has been running in newspapers since 1954. Browne eventually gave up his advertising career to focus on comic strips, creating Hagar in 1973. But the iconic characters he drew for Johnstone & Cushing clients live on, even decades later. Here’s the original Chiquita Banana commercial, by the way—props to them for working “most digestible” into a catchy jingle.